Thanks to my intern Rachel for this blog post! “Beautiful: The Carole King Musical,” playing at The Aronoff Center for the Arts in Cincinnati through May 14th, is as enjoyable as any of Carole King’s many hit songs. If opening night’s audience is any indication, it appeals to men and women of all generations. Though most in the audience had probably heard these songs nearly a thousand times, the talented cast brought such personality and charm to the arrangements that they seemed brand new. Filled with nostalgia, a joyous audience accompanied every tune by singing and dancing along. This musical is hit after hit all throughout the entire two hours and 20 minutes. Although the show was much more than just a showcase for Carole King‘s songs, it told a wonderful story about her well-deserved rise to fame, and the people along the way that made it all happen. It is an engaging story of Carole King‘s rise from young dreamer to star of her own performance at Carnegie Hall. These successful but sometimes tumultuous years between 1959 and 1971 see Carole selling her first hit song to Don Kirshner, her marriage to lyricist Gerry Goffin, the births of their two daughters, their friendly competition with songwriting duo Barry Mann and Cynthia Weil, her move to Los Angeles from New York, the recording of her solo album Tapestry, and finally her successful solo concert at Carnegie Hall. The songs are cunningly and effectively merged with the story as a backdrop to the actual emotions of the characters as they fall in love, find success, divorce each other, and move away. Julia Knitel, as Carole King, was a pleasure. She carried the show both with humor as well as a sort of dorkiness that completely melted into confidence every time she sang a ballad. The ensemble was just as interesting to watch as they would each switch roles into different famous groups and teen idols of the time like The Drifters, Neil Sedaka, The Righteous Brothers and the Shirelles to sing the beautiful and successful hits written by Carole King. 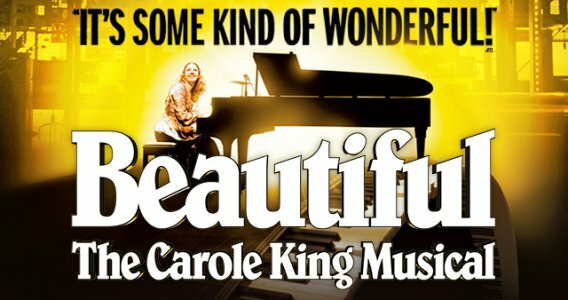 “Beautiful: The Carole King Musical,” is playing at The Aronoff Center for the Arts in Cincinnati through May 14th and is a great mother’s day gift for any Carole King fan out there!